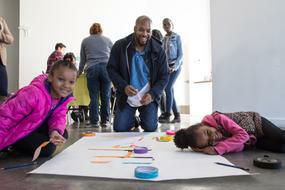 By providing an open forum for discussion and experimentation, the Education Department at the Bronx Museum works as a catalyst for ideas and dialogue. We promote engaging and transformational art experiences with the goal of connecting the viewer’s personal experience with relevant areas in contemporary culture. 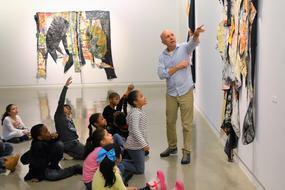 The Group Visits Program is the Bronx Museum’s main service to schools and community groups, providing both inquiry-based and hands-on participatory experiences with contemporary art. 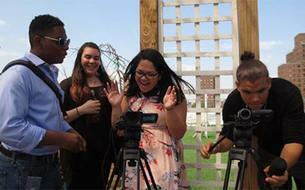 Sessions are based on viewer participation with the goal to foster visual literacy and critical thinking. To begin scheduling a tour, please fill out the tour registration form here. Teen programs at the Bronx Museum provide young adults with an open forum for the creative expression of ideas and dialog on issues affecting young people and the promotion of the Bronx as an important cultural, political, and artistic force. As the twenty-first century moves forward, challenging our preconceived views about what art is, the task of connecting contemporary art to existing models proves to be more complex and demanding. It is vital then that our youth learns important aspects of museum culture, especially that of contemporary art museums. 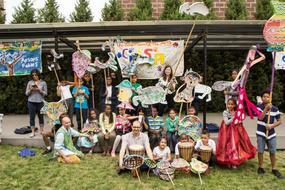 Cultural After-School Adventures (CASA) serves 5th grade students from P.S.73. During sessions, students read classic work of literature, visit the Museum's current exhibits, and synthesize their experience through puppet-making and other smaller projects inspired by the themes and imagery. For three years, the Museum has led a series of anti-gun violence after-school programs at local middle and high schools located in police precincts with high incidences of gun violence. 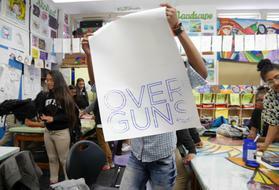 At each site, participants use art to create an anti-gun violence campaign.